FOR IMMEDIATE RELEASE: Lewiston, Maine (June 15, 2016) – Fighting anyone, anywhere, anytime and under any circumstances has become Mike Hansen’s calling card with New England Fights. 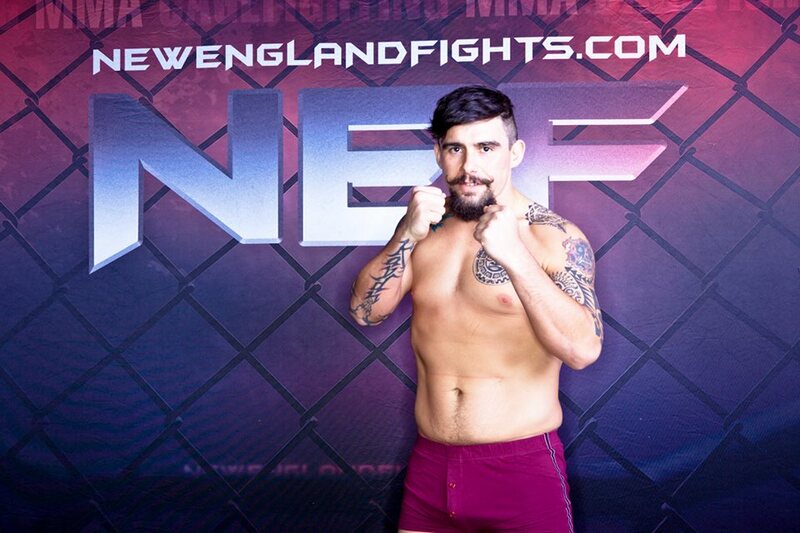 No surprise, then, that the 30-year-old father of three from Rumford, ME will gladly entertain the idea of a mixed martial arts contest … against an opponent about whom he admittedly knows precious little … on the eve of Father’s Day. Hansen (4-4) will take on Robert Laroski in a heavyweight clash at “NEF 24: Promised Land” on Saturday, June 18 at Androscoggin Bank Colisee in Lewiston. There is no fear of the unknown in a man who has carved out his reputation confronting substantially bigger foes since his days as a state champion wrestler at Mountain Valley High School. During his relatively short time in NEF, Hansen has fought as a middleweight, light heavyweight and heavyweight. That’s the attitude of a fighter whose skill and talent level far exceed his current record as a professional. Hansen’s docket includes a stoppage win over former NEF “Fighter of the Year” Crowsneck Boutin. His record also includes TKO losses to Battles and Cody Anderson and a choke-out at the hands of Zach Elkins. When he reflects upon his unique life story, Hansen, who fought twice for the World Fighting League as a 20-year-old college student, marvels that he ever got back into the cage at all. Hansen kept a promise to his father to quit the sport after a knockout loss to Alexander Chianurashvili in 2006. He was studying at Massachusetts College of Pharmacy, with intentions to enter the medical field. He was stabbed and attacked with a baseball bat by three men in a case of mistaken identity not long thereafter. “I walked out of the hospital the next day, and all three of them were still in there from the beating I gave them in self-defense,” Hansen said proudly. That dogged determination served Hansen well in the United States Army, where he studied in the elite Combatives program. A few years later, Hansen found that inner fire again. Even as he returned to coaching wrestlers in his hometown, his own physical fitness suffered as work and fatherhood took precedence. Hansen vividly describes sitting in a bean bag chair, eating snack food, watching TV at 2:11 a.m. when his phone rang. He assumed it was a friend in trouble. “It was (NEF co-owner) Matt Peterson. Our families grew up maybe 200 yards apart. My high school wrestling coach had called him, unbeknownst to me, to tell him he needed to get me back in the cage,” Hansen said. Three weeks later and 20 pounds lighter, Hansen dispatched super heavyweight fixture Artie Mullen at “NEF 16: New Blood Rising,” and the comeback was on. In the 15 months that have followed, Hansen has been instrumental in launching Berserkers MMA and building his reputation as both a fighter and an instructor. Life is blossoming at home, also. Hansen is the father of two girls, ages 5 and 2, and a boy of four months. His older daughter, Kaydn, often accompanies Dad to the gym at Greater Rumford Community Center. He returns the favor by chaperoning field trips for her kindergarten class. Kaydn’s parents are making plans to take her to her first live NEF show after she turns 6. For now, she is content to watch her Dad’s fights on YouTube.